ON-ROAD ENTERTAINMENT: Music and cruising were made for each other. AM/FM radio with USB and AUX inputs for cell and MP3 player, located in the glove box, drives four speakers up front. 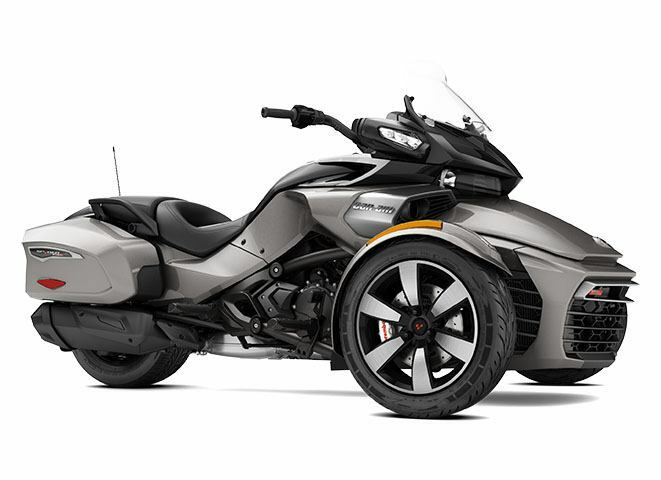 BRING MORE...: In addition to the trademark Can-Am Spyder front cargo area, there is a glove box and two smartly-styled hard side luggage cases for a total of 21 gallons (78 L) of cargo capacity. SLEEK PROTECTION: On long rides, you'll appreciate the added wind protection and convenience from the low windshield, integrated rear-view mirrors and glove box. YOUR ESSENTIALS, IN FULL COLOR: A vivid, full-colour digital screen allows quick access to key vehicle information such as speed, trip distance, and RPMs. COMFORT ON THE FLY: The rear suspension is comfortable and controlled, with an air preload adjustment that makes it easy to optimize performance for rider, passenger and cargo weights. ENGINEERED FOR A SMOOTHER RIDE: These premium wide-diameter shocks ensure a plush ride even on bumpy backcountry roads and are quiet at all speeds.